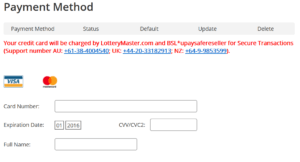 Lotterymaster provides an easy and straightforward online lottery agent service, but their many missteps outweigh the things that they do get right. It's unfortunate – especially since there is potential here. 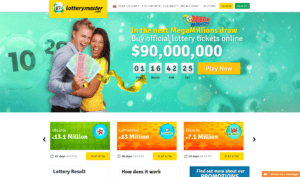 Lotterymaster offers some of the most popular lotteries around, wrapped in a website that is a breeze to use. Their education materials are impressive as well, as are their security measures. It's also noteworthy that they make it a point to claim winnings – even jackpots – on a player's behalf. However, all of that is hampered by limited game choices, ridiculous withdrawal fees, commissions on higher payouts, limited payment methods, and expensive ticket prices. As such, it's easy to write off Lotterymaster. No one would blame you for looking elsewhere. If you're still curious, however, read on! Lotterymaster currently has 12 games on offer – which isn’t bad, but not entirely impressive either. That said, while they may not be able to match the game offerings of industry stalwarts like theLotter or WinTrillions, they do have some of the biggest and most lucrative games around. These include US Powerball, EuroMillions, SuperEnalotto, and Mega Millions, among others. The cost of entry at Lotterymaster is quite expensive. In fact, Lotterymaster’s prices are even more expensive than theLotter’s (read more in my TheLotter Review) – another lottery site that has pricier-than-the-norm tickets. Lotterymaster offers the same number of group play games as their regular solo games – which is surprising. While most lottery sites’ syndicate offerings make up only a small fraction of their entire game selection, Lotterymaster does the complete opposite. They offer group play options for each and every lottery game they offer – which means that they currently have 12 syndicates on tap. This is great for those who can’t get enough of syndicate play. For the most part, Lotterymaster’s banking options are lacking compared to other lottery sites. Currently, they accept Visa, MasterCard, iDeal, Yandex, Skrill, Qiwi, Klick & Pay and bank transactions. They don’t provide any other details regarding these payment methods, which was disappointing. I was also left confused when, upon reviewing my purchase order, the only available payment options were for credit cards, Skrill, Yandex, Qiwi and NETeller. More confusing was how only Visa and MasterCard were the only deposit options available when I wanted to add payment methods in my account. No other options when adding payment methods. Beyond that, Lotterymaster also deducts a fee for all withdrawals. The amount you would have to pay differs depending on where you live. For players who reside in Australia, Europe and South America, you would have to pay $2 or $5. It then goes up to $10 if you live in Canada or Asia. Those who live in Africa, Central America, and the US get the shortest end of the stick: you’d have to pay $50. Despite their shortcomings, you can at least count on Lotterymaster’s website to be safe and secured. For starters, they utilize EV SSL encryption from GeoTrust to secure connections. They are also carry McAffee Secure and Norton Safe Web System licenses, as well as verification logos from Visa and MasterCard. Meanwhile, the Webutation logo on their website really needs to be updated as it is pretty misleading. It currently displays a 100% score, but on the Webutation site Lotterymaster’s score is 40/100. That said, despite the low score, Webutation still confirms that the site is pretty safe. Their customer support options are a mixed bag – especially when it comes to the FAQs. While it manages to discuss some of the basic aspects of their service, Lotterymaster’s FAQs fall short compared to the more informational ones offered by its competitors. Thankfully, you can easily get in touch with them if you feel that the FAQs are insufficient. You can contact them via phone (for which they have 4 different lines), direct email, and live chat. They advertise 24/7 availability, but that doesn’t seem to be the case – at least for their live chat. But considering you have an array of options at your disposal, it’s not so bad. Educating players about the different lottery games and terminologies is where Lotterymaster shines. On top of the usual informational sections found in each lottery game page, they also offer dedicated info pages for all of their 12 games. These go much more in-depth than what you can find in other lottery sites, which is a really nice treat for those that want to learn more about these games. 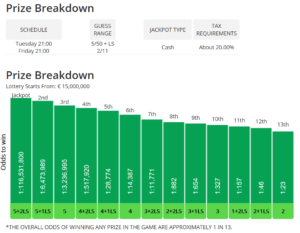 The info pages discuss things like Prize Breakdown, Odds and Probabilities and more. Lotterymaster’s education materials are pretty in-depth. Another thing I found impressive was Lotterymaster’s lotto dictionary. In this section, you can find information on all the lottery terminologies that you need to be familiar with. This section should prove to be an invaluable resource for lottery beginners. Lotterymaster has a website that’s simple and ease to use – but there are a few snags. Their website is pretty simple and, for the most part, easy to use. The front page features all the latest jackpots and results, along with dollops of information about their service. Up top, you can find the main navigation menu, which can take you to the list of lotteries, the results page, your account, and their support section. Overall, a pretty standard – and effective – lottery site. I didn’t like a few things though, such as how limited the language support is. They currently only support English, French, German and Russian, so a player who understands an unsupported language would have to go elsewhere. I also don’t like that they don’t provide all the links to group play options in one page – you’d have to go to each game page to access it. It was a bit tedious clicking on them one at a time just to get a glimpse. Lotterymaster’s promotions are pretty interesting – and enticing – but the multi-draw discounts could be better. Don’t get me wrong, it’s great that you can get discounts the more draws you choose to participate in. However, you only get discounts if you choose 8 draws or more – 2 or 4 draws won’t cut it. Thankfully, every time you purchase tickets at Lotterymaster, you automatically receive VIP Frequent Player Points. Every €1 you spend gets you 1 VIP Frequent Player Point. The more points you have, the higher your VIP status becomes. Each VIP status – or level – allows you to receive different cash back bonuses. Creating a free account with Lotterymaster is as easy as 1-2-3. Click on the green “Sign Up” button located at the upper right corner of the website. Complete the registration form, which asks you to provide you first and last name, your contact number, and email. 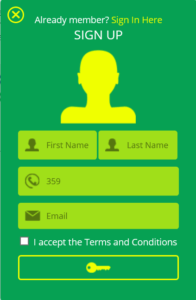 Accept the Terms and Conditions, and click on the key image once you’re done. And that’s it! I really liked how quick and hassle-free Lotterymaster’s sign up process is. There’s no long forms to fill and no weird restrictions – it just needs a few minutes (or even seconds!) of your time. Lotterymaster should feel familiar to old hands, while newcomers should be able to learn quickly. Log in to your Lotterymaster account. Choose from any of the lottery games on offer. Pick your numbers. You can do so manually or automatically via their Quick Pick/Lotto-Matic option. Choose whether you want to participate in a single draw or multiple draws. You can also choose to subscribe. Review your purchase order and enter your payment details. After purchasing, Lotterymaster will then purchase the ticket on your behalf, scan the original and keep it for safekeeping, then send a copy to your account. Lotterymaster doesn’t immediately make it clear how they handle winnings; rather, you have to do a little digging to find out. That’s exactly what I did – which I didn’t like, to be honest. Most lottery sites provide this detail upfront, so I’m not sure why Lotterymaster saw fit not to do so – especially when they do things a bit differently than most lottery sites. See, if you do win, they will claim the prize on your behalf, including jackpots. This makes claiming prizes a whole lot easier, but it has an unfortunate side effect. That is, if you win $1,000,000 or higher, Lotterymaster will charge you a 10% commission (on top of any required tax deductions). They say that this fee is due to handling fees. It makes sense for large/jackpot wins – but it would have been better if they had offered the choice to claim it in person should a player not be comfortable with the commission charge. theLotter is king when it comes to game selections – they have a whopping 53 lotteries on tap. They also have 24 syndicates, and a seasonal raffle. They accept way more payment methods. Whatever payment method you use or prefer, there’s a good chance that you can use it at theLotter. They accept over 29 payment methods, after all. Their tickets are expensive – but still more affordable. theLotter is known in the industry for their expensive tickets, but they still prove to be the more affordable option compared to Lotterymaster. They offer tons of game types! You can choose from 20 lotteries, 1 3syndicates, and various raffles. They also accept tons of payment methods. You should have no problems depositing or withdrawing cash at WinTrillions – they accept 32 payment methods. You won’t be able to participate in single draws. You can only purchase tickets for multiple draws. This also means that you’d have to spend more than usual if you want to play here. LottoKings proves to be one of the most affordable options around – with ticket prices that come close to their actual retail pricing. Choose how you claim your prize. You can choose whether to authorize LottoKings to claim your prize for you – which you can get via check or their nearest office – or you can do it yourself. Don’t get your hopes up about ticket scans as LottoKings only sends purchase invoices. Give this one a pass – there are better lottery sites out there. Like I’ve said before, Lotterymaster isn’t a terrible lottery site, but they do commit several missteps that could potentially ruin your experience. They have a few things going for them, but ultimately, it doesn’t make a lot of sense to play here when you can find cheaper lottery sites that don’t charge you a fee for every withdrawal or take a commission from higher payouts. Owned and operated by Safe Global Payments, Ltd., Lotterymaster is an online lotto agent service that allows people to play in lotteries from around the world straight from the comfort of their homes. They run offices in Australia, Europe, USA, and other continents, which allows them to easily purchase tickets on a player’s behalf. I’m sorry to hear about your bad experience. It’s one of the reasons they’re not very high up on our list. If your interested, please take a look at our review on TheLotter. They’re a fantastic platform with lots of wins under their belt and a very trustworthy company! Lottery master is a leading online gaming portal that gives customers the chance to win amazing prizes, right from the comfort of their home. They give you an option to buy hundreds of tickets on syndicate, which basically means that multiple players can place a pool of tickets into a single draw, making it possible for you to get more tickets in a single draw, for a cheaper price. I recently purchased 70 tickets from lottery Master and won the jackpot. I was overwhelmed with the winning amount. It sure made my day. I can honestly say that I am pleasantly surprised by this website. Me and my friend had recently purchased tickets on syndicate. The purchasing offer turned out to be great since we really won mind blowing prizes through it. I’m happy with this website and would recommend everyone to give it a try. Login/sign-up/ticket buying process is very easy. The FAQ section is also a great help.